I never meant to be a teacher. But here I am. My mother, a devoted kindergarten teacher, brought home laminating to cut and scoured our kitchen for classroom craft supplies on a regular basis. She also had the best stories of all of us, to tell at the dinner table- and more drive than I ever understood as a child. Teaching is not my first career, or my second... maybe not even my third. But apples do not fall so far from their trees. Before coming to education, I worked in the arts, wine production, and vineyard management, both domestically and abroad. I am grateful for those experiences because they've shaped my perspective immensely. Moreover, those opportunities were available to me because of the education I received growing up. No one can know enough to be prepared for every situation, but knowing how to learn what you need to know can open worlds of possibilities. This is the kind of education I strive provide in my own classroom. I came to my driving question after four years of watching myself and my colleagues reinvent the wheel with every new unit we taught. Within a short period of time, our standards changed, we began implementing PBL, and our district began emphasizing the 4 C's (now the 6C's). While each of these inspired feelings of enthusiasm and promise, they also carried moments of overwhelm. Teachers who had been honing their craft for decades wondered if they were expected to abandon even their most vetted practices in favor of "discovery learning". It seemed clear that education needed to change with our changing technology and culture, but our students still needed help building their basic skills. Fortunately, a timely PD with Michael McDowell gave me hope that the new visions for our practice could be carried out in a way that was practical and standards-based. We could emphasize the Learning in PBL. When considering TPACK, one might say I began this program heavy on the "T" and "CK", but working with a lowercase "p". My experience in professions outside of education exposed me to numerous technologies- many of them new- that helped make work more efficient. So I came to teaching with an attitude of fluidity toward technology, for which I am grateful. Extensive reading and writing for my B.A. and continuing education made me confident in my content knowledge as well. Effective pedagogy within PBL, however, especially with disadvantaged students, was where I needed the most growth. Through my coursework and action research, my understanding of pedagogy is catching up with the rest. Close reads, direct instruction (flipped or otherwise), and think-pair-share, for example, have a solid place in my classroom, even within the context of PBL. My content knowledge is also improving with practice- there are so many Common Core standards to learn with ELA, but the more I teach them, the better I get. As I mentioned earlier, my willingness to take risks with technology has been constant since I began teaching. However, through my master's study I have gained several more tools for my tool belt, such as add-ons, tools for flipping instruction, and animation platforms. More importantly, I have a better understanding of when and why to use these tools. My journey with Touro began as a situation of right place, right time. Though my pre-teaching travels and careers shaped me personally, I needed something to take me deeper professionally. I could not have predicted what a rewarding journey it would be. My studies began with a sobering look at how our nation's education system compares with others around the world. I usually cringe at assigned reading, but reading and discussing The Flat World and Education broadened my scope on policy and equity. It also made me understand specific areas of growth that are lacking in our own country. If providing equitable education was simple, it would have been done already. However, there is a great deal of evidence out there about shifts that do work. Nonetheless, it seems policy often goes in a direction opposite of those shifts. Reading such a well-researched perspective on education caught my attention early in my master's study. Coursework and ongoing studies "filled in the gaps" about the necessity of basic good teaching that must be in place if students are to learn standards within the context of PBL. 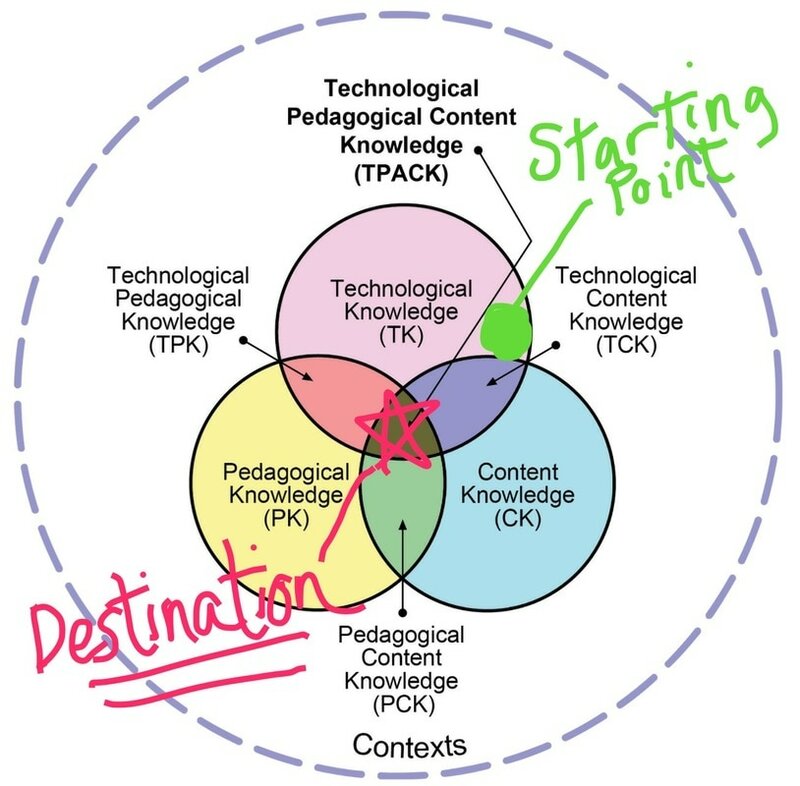 I constantly compared my own research with the learning models presented in SITE, TPACK, and the Four Pillars. One of my favorite reads was Bobbe Baggio's The Visual Connection; it provided practical, simple ways to present visual information that works regardless of what or how you're teaching. Ruth Clark's Developing Technical Training also offered valuable examples of breaking down information and teaching content, processes, and procedures- again, solid pedagogy for any context. My mom is fond of saying that teaching is a craft. As with any craft, there is no substitute for time and experience. I hope to gain both in the years to come. That said, my master's study has given me a breadth and depth of understanding that I intend to draw upon from this point onward. For example, my studies have given me confidence about how and why to use certain technology in the classroom, as well as the value of putting the computer away. Conversing with cohort members who teach kindergarten through high school has also given me pause, in the best of ways. I so often see things through middle-school-tunnel-vision; discussing our learning with teachers in other schools has reminded me that one size does not fit all. As my journey continues, I hope that I have more to offer the community at my campus. I am so frequently in a position to learn from the many colleagues I admire; I am completing my masters program with tools and perspective that might be of use to them as well. I have come so far, but I've got so much farther to go!